Dutchie goes Grand Hotel Amrâth – Dutchie. The Grand Hotel Amrâth Amsterdam is located in an imposing building with a stunning staircase. Normally we come here to snap pictures of the staircase but this time we actually were staying the night. I wasn’t around during the more extensive tour they gave my girlfriend so this article is fully based on my more “regular” guest experiences. Then again, this is a five star hotel, so i’m expecting nothing but the best either way. The one thing I did know up front, the view from the rooftop is amazing. Truly amazing. But, the rooftop isn’t publicly accessible so that’s unfortunate. I’ve been there multiple times, but would love to be able to just walk in and go up there when one of our crazy Amsterdam sunsets occur. So, again, Grand Hotel Amrâth Amsterdam is a Five star deluxe Grand Hotel which is located in the former Scheepvaarthuis, a decorated monument and example of the Amsterdam School architecture. The five-star deluxe hotel has 165 rooms, including 22 suites, 8 conference/banquet rooms, a restaurant, a bar/lounge, and a Spa & Wellness centre. And I must instantly admit, the Spa and wellness area pleasantly surprised me! Surely more so due to the fact we were the only ones there during the early morning. How relaxing! 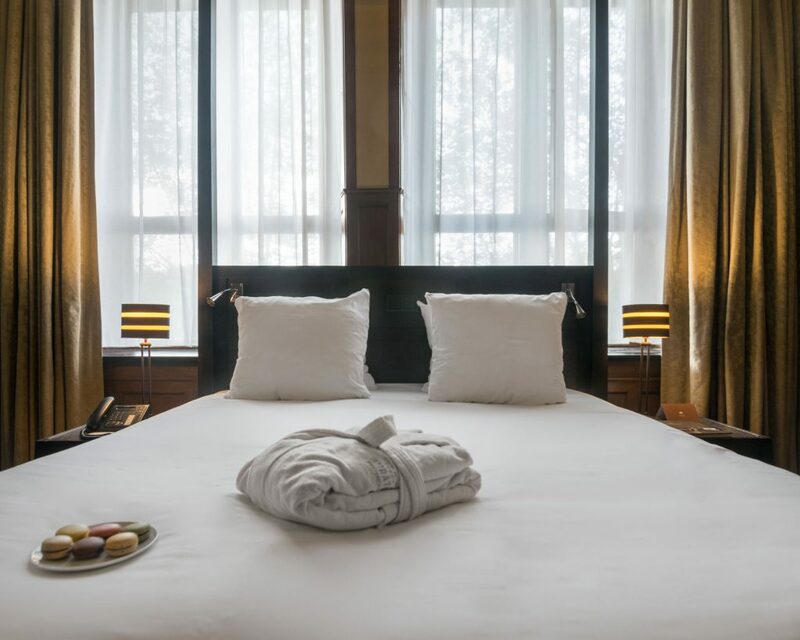 Location wise the Grand Hotel Amrâth Amsterdam is located only 500 meters from the central station, where you will find bus, tram, and metro connections to all areas of the city. When you walk into the hotel it’s like you walk into history. So much history in the building and this is very visible everywhere. The con to this, to me, is that it makes the hotel feel a little “old”. Surely the luxury part is in place and well deserved but somehow (again, this is my opinion) this feel to much classic hotel, and due to the history with much brown and yellow colors something our parents, or grandparents would go for. Judging most of the guests I saw, this indeed is the case. A few young people as well but it seemed more elder people chose this hotel. Compared to the other hotels I have been able to visit in the city, the average staff age also seems a bit above the average at places like the “hip” Andaz Prinsengracht Hotel, Ink Hotel or Conservatorium Hotel.